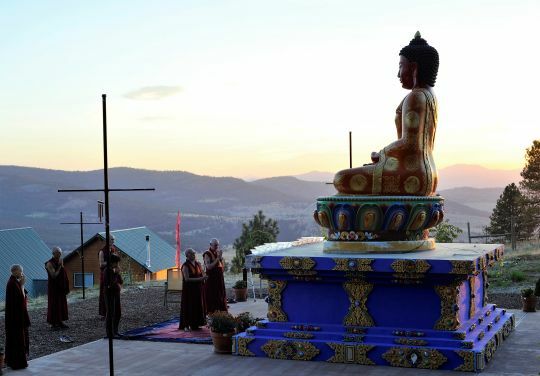 Lama Zopa Rinpoche and Sangha make prayers in front of the Buddha Amitabha statue at Buddha Amitabha Pure Land, Washington State, US, September 2016. Photo by Ven. Lobsang Sherab. In regard to the recent election in the United States, I wanted to suggest that you make prayers that loving kindness, compassion, and bodhichitta be generated in the heart of Mr. Trump, all the government people and everybody else in the country, and even in the heart of people in other countries. In that way everybody in the United States and in the world can enjoy perfect peace and happiness. Pray also to pacify war, famine, disease, economic problems, and the dangers of fire, wind, water, earthquakes, and tsunamis in the United States and the whole world—may these things never happen and may there be perfect peace and happiness in the United States and the rest of the world. Pray that America will help and bring harmony to other countries and cause perfect peace and happiness to them and to help everyone to develop the correct wisdom that pacifies suffering and brings ultimate, everlasting happiness. We all need to develop the correct ultimate wisdom realizing emptiness and bodhichitta. If we ourselves do not wish to suffer, we need to be free from samsara. That is why wisdom is so important. Don’t harm yourself and don’t harm others—practice the good heart towards others. This will bring peace and happiness to all living beings in this world, to the United States, to your own family and lastly, to you yourself. You are the last one. Transcribed by Ven. Holly Ansett, November 14, 2016. Edited by Nicolas Ribush and by Mandala for inclusion on FPMT.org.